Fin Fang Foom is a giant, green dragon … with purple pants. But, don’t be misled – that’s not my concern here. After all, it’s common knowledge that green monsters have to wear purple pants. 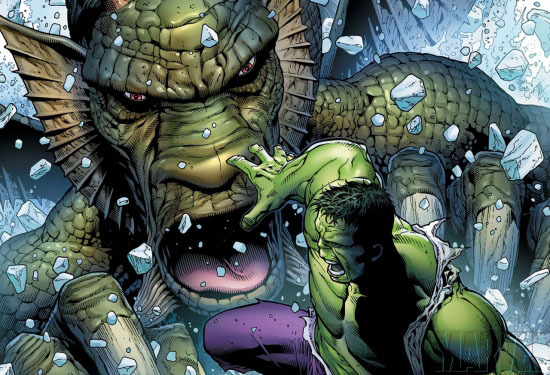 In fact, two purple-pantsed green monsters squared off in a one-shot from the 2000s. Check it out! So, I’m fine with a giant dragon wearing pants. We can’t have Marvel artists drawing ginormous dangling dragon bits, can we? Kids read these things! … right? So, we’re to believe that this ancient, slumbering dragon took the time to study martial arts? I don’t buy it. Plus, Foom’s 32′ tall! For real – I’ve measured! What does a giant dragon need a martial arts fighting strategy for? When you’re that big (and equipped with “fire breath”, no less) it’s just all about smash! smash! smash! But, I guess we’ll let this one slide. After all, this storyline was only his second appearance since he debuted in Strange Tales #89 (October 1961) so the character hadn’t been fleshed out much by this time. However – let’s keep Foom as a dragon … not a “karate killer”!